Bring Your New Website to Life In Print! Give Your Customers the Information They Need In Their Hands! 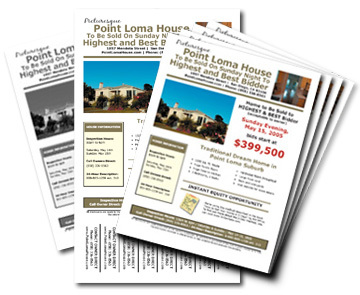 With a time-tested combination of highly informative, professionally-designed printed media, your buyers will be well informed — eliminating time consuming questions and less than serious buyers during your open house. This is an wonderful addition to the 5 Day Sale marketing system, and works to kick your sale into overdrive and increase the overall results of your sale. It puts your home's marketing campaign right into the hands of your potential buyer — they'll fall in love with your home before they even walk in the door! 8.5 x 14" Full Color Tear-off Tab Poster that you can have printed to promote your 5 Day Sale. 8.5 x 11" Promotional Flyer Design that you can print and pass out to neighbors, friends, relatives, and local businesses. 8.5 x 11" info-packed, 18-24 Page Printable Brochure created using your custom website photography and copy. Use as a Master Tour Booklet your buyers can download directly from the website and reference before and during the bidding process. Stimulates bidding and reduces questions during the open house. Upgrade Available! Need a custom website to target the maximum amount of prospective buyers 24-hours a day? Click to learn more on how to upgrade your "Site Specific" Website Package A to include a complete marketing blitz! The Complete Real Estate Sign Kit is guaranteed to improve the results of your sale. There is nothing else like it available to home sellers! Now it's possible to create a whirlwind marketing blitz AND save money in process! 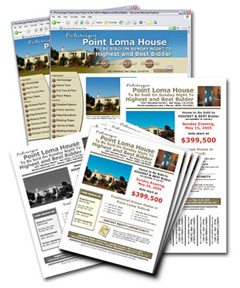 Buy a Custom Printed Media Packet and combine it with a Custom 5 Day Website Package "A". Total Price: $1249 - Save $175! Buy a Custom Media Packet and combine it with a Custom 5 Day Website Package "B". Total Price: $1495 - Save $175!